Study this drawing. 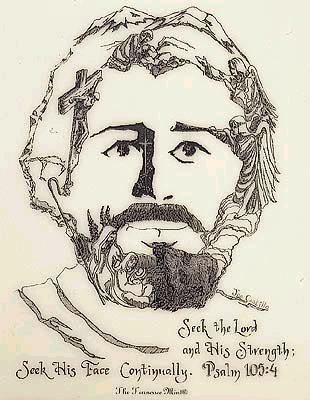 It is full of detail sketches from Christ's life. I admire the writers of dictionaries for their abilities to state the meaning of words with precision and economy. Paul shows a similar talent in our reading today as he explains how all of humankind is implicated in Adam's sin and how Christ's incarnation, death, and resurrection was/is effective to pay the penalty of that collective sin. His communication powers reach their height in verse 18 where he sketches out the Gospel as it plays out through history in a mere 33 words. even so, through one Man's righteous act: that "one Man" is Jesus, God's Son. His righteous act is that He came to earth, lived a sinless life, died in our stead to pay the punishment our sin deserved, then rose to defeat death. (John 3:16). came to all men: this gift is available to all men everywhere (Romans 10:12; 1 Timothy 2:4-6) and covers the sins of people past, present and future (John 10:16). What a grand, mind-boggling, worship-inspiring plan. (And I'm so glad that God inspired brilliant thinkers like Paul to express it concisely.) I have accepted this free gift - have you? PRAYER: Dear God, thank You that Your plan for humankind involves justification - and that it's free for anyone who will accept it. Please give me the wisdom and the right words to communicate this good news to those who have never heard or understood. Amen. MORE: Hillsong sings "Mighty to Save"